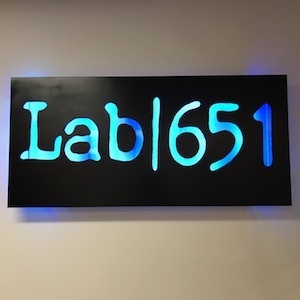 August 9, 2017 — St. Paul, Minnesota — Lab 651 LLC today announced it has begun offering a broad range of product development services in its mission to “connect the physical world to the digital universe.” The Internet of Things (IoT) firm also announced the launch of its new web site at Lab651.com. The sign welcoming you when you visit Lab 651. The Internet of Things, also known as “IoT,” is a trend that has been evolving for several years. It’s based on the concept of ordinary, everyday objects becoming more intelligent and connected to the Internet. That can span everything from a device in your home, to a factory, to something implanted in our bodies. Previously, the three cofounders of Lab 651 each had their own companies of highly experienced engineers active in this area. “After working together on a number of projects, it made sense to create one company that had all these skills to help our customers iterate and build solutions quickly,” said Grammens. Lab 651 works with a diverse set of clients — from startups with brilliant ideas and an initial stage of investment to bring their product to market, to Fortune 100 companies who are looking to Lab 651 to provide them with a group of highly experienced engineers to build innovative products quickly and less expensively than if they engaged their own resources. The team has experience working with such large firms as Best Buy, Honeywell, McDonald’s, and BuzzFeed, and with startups such as Fluid, VariAware, SkyShepherd, and Wildflower Schools (which began at the MIT Media Lab in Boston). “We find the largest value for our clients comes when we can build and test early prototypes with their end-users, and help to learn and guide them on what it means to build a connected product,” said cofounder Grammens.